Note how names are used in the conversational Burmese instead of the first and second person terms "you" and "I". Ma Khin Hmone, are you in love with Ye Aung? What do you think, Ako? It's obvious that he likes me. He is in love - from his side. Ako also knows that too well. Oh, are you going to tell Hmone (me) Hmone should marry him? But, 'you must marry Ako (me)' - that I am going to tell you. Is Ako in love with Hmone? In love with Hmone? Why are you asking me back? Is Ma Khin Hmone involved with Ye Aung or not? Hmone is unblemished. No, Hmone is not involved with him. Wait a minute... Why does Ako come and ask Hmone this in such a hurry? Only now, Ako has such thoughts: Ako can't live without Hmone. Will Ma Khin Hmone marry Ako? Will you? Surely, Ma Khin Hmone will do. 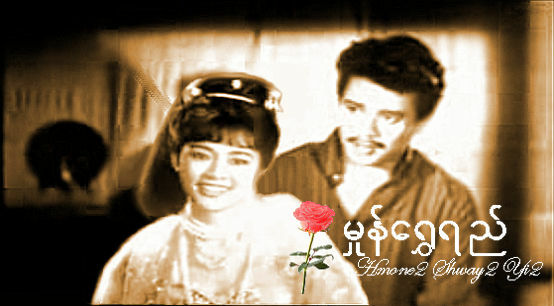 Hmone Shwe Yi ( hmone2 Shway2 Yi2 | မှုန်ရွှေရည် ) is a classic Myanmar movie directed by multi-talented Burmese actor, singer, writer, composer, publisher and director Win Oo (1935-1988) who also played instruments. "Hmone Shwe Yi" song and dance is a must-see for anyone interested in authentic Myanmar culture. Creative words used in the song are ideal for serious learners of Burmese language and literature. The lyrics of the theme song are poetic rhymes of 3 to 5 syllable words, and a number of verses are made of original coined words having the same or closely-related meanings. "Hmone Shwe Yi" the movie itself and several videos of the theme song are on the Internet, but I have yet to find a version with English translation to present it to the World. Just like the work of Shakespeare is not easy to understand, the poetic words in this song will not be fully appreciated unless explained. Even if you don't know a word of Burmese, you can still enjoy watching the Burmese traditional dance in two YouTube videos that I have selected. The second video is the modern re-make of the song with Karaoke style Burmese script to sing along. May Than Nu, the dancer/actress in the modern version of Hmone Shwe Yi video is not related to the actress Khin Than Nu in the original version. မှုန်ရွှေရည် | Mhonshweyi won the Best Picture Award and ဝင်းဦး | Win U won the Best Actor Award in 1970 Myanmar Motion Picture Academy Awards. Back in 1967, the same ဝင်းဦး | Win U and ခင်သန်းနု | Khin Than Nu pair won Best Actor and Best Actress Awards in an another movie ဆောင်းအိပ်မက် | Hsoun3 Ain2 Met | Saung Einmet (Winter Dream). The pair in the second video မေသန်းနု | May Than Nu and ရန်အောင် | Yan Aung are also well known veteran actor and actress today, although they no longer play the leading roles. He won the Best Actor Award six times in 1991, 1995, 1996, 1998, 2000, 2006 and she won the Best Actress Award four times in 1995, 1996 , 2000, 2001 and Best Supporting Actress Award in 2002. The story is about a fictional performing artist and a stage dancer named "Ma Khin Hmone" who is compared to the golden flower pollen of a rose with sweet fragrance that attracts and loved by everyone around. Hmone2 | မှုန် in Hmone2 Shway2 Yi2 | မှုန်ရွှေရည် refers to the flower pollen woot hmone2 | ဝတ်မှုန်. Shway2 | ရွှေ meaning gold is included in the name to show that something or someone is highly esteemed. yi2 | ရည် in this context could mean the nectar of the flower as in ပန်းဝတ်ရည်, and it can also refer to the word တောက်ပခြင်း meaning something lustrous. So, "Hmone Shwe Yi" or "Hmone Shwe Yee" romanized in the tone system as hmone2 Shway2 Yi2 | မှုန်ရွှေရည် can be translated as "Lustrous Golden Flower Pollen". si2 | စီ - line up in an organized way. The opening line hmone2 shway2 yi2 | မှုန်ရွှေရည် rhymes with htone2 way2 si2 | ထုံဝေစီ, which also rhymes with wa1-thone2 myay2 ma1-hi2 | ဝသုန်မြေမဟီ to depict the fragrance of the flower pollen that permeates the earth. a-twin3 | အတွင်း - inside; used here as a postpositional marker: "within"
gah1 | က - is; postpositional marker to make the noun "subject"
dthi2 | သည် - ending affirmative word (literary form)(postpostional marker). Feel like embracing the bright and slightly colored rose on the stalk with golden pollens having pleasant fresh scent that permeates the deep forest. The modern version replaced the "freshness" with "clear". 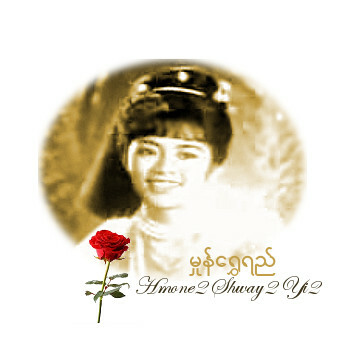 pan2 a-hla1 Hmone2 Shway2 Yi2 | ပန်းအလှမှုန်ရွှေရည် - beauty of this flower "Hmone2 Shway2 Yi2". This passage alludes to the girl who had safeguarded her dignity and reputation despite the fact that she is very popular and surrounded by admirers who are too eager to "pluck" the blossoming flower bud from the stalk. Here is another one of those rhymes: nun3-ma1-wah1 | နမ်းမဝ - insatiably inhale and kiss the pan3 a-hla1 | ပန်းအလှ - beauty of the flower. The heart and the feelings of all beholders get drown in the enchanting sea of love. The original version used the word byi2 | ပြီ to imply that the limelight and popularity has just begun for the young entertainer. The modern version missed the point, and replaced the word with dti2သည် , which is plain ending affirmation word in literary form. pyi2-thu2 a-theare3 sweare3 Hmone2 Shway2 Yi2 | ပြည်သူအသည်းစွဲမှုန်ရွှေရည် - a favorite of fans (or idolized by fans) all over the country. myit-ta2 yay2 ma1-thway2 thoon3 pfyo3 lo1 | မေတ္တာရေ မသွေသွန်းဖြိုးလို့ - abundant affections pouring down like rain water and does not stray away. The modern version missed out the point of love that does not stray away. In addition, the original version maintains the rhyme ma1-thway2 | မသွေ with yay2 | ရေ , which continues on to shway2 | ရွှေ (gold) and ngway2 | ငွေ (silver). shway2-mo3 ngway2 mo3 ywa2 myi2 | ရွှေမိုးငွေမိုးရွာမည် - certain to bring prosperity as though the sky opening up to fall gold and silver rain. My personal point of view is that we should not re-write the original work of Shakespeare. It will do disservice to the genius of the original creator. For someone who is well-versed in the Burmese Language, the rhymes, the rhythms and subtle meanings of tender, heart-warming words in "Hmone Shwe Yi" will just leave the mind's eyes with imagination in the whole new dimension. The graceful movements of Myanmar traditional dance by Khin Than Nu fittingly completed the missing half of this Myanmar classic to make "Hmone Shwe Yi" one of the greatest shows of all time.